Beautiful Incentives: Looking for a Plus Size Prom dress? Looking for a Plus Size Prom dress? Spring is in the air and the smell of money is too. Why? Because prom season is here and this is when we scrounge to afford our own or our daughter's prom dresses. We want them to look beautiful, but we don't want to break the bank doing it. Is your daughter Plus size? Meaning anywhere from size 14 to size 26 and beyond? Then you may have not known this, but your chances of finding Plus Size Prom Dresses in store and affordable are far less than if you shopped online! Let's just face it, the world has opened up to plus size catering, but at the same time, they take advantage of the plus size clothing arena by charging far more than needed. We all know it takes more clothing to fit more of a woman or teen, but they definitely take advantage of this fact and it's clear by the sky rocketed prices. They know there is a huge market, pun intended? for plus size females. When shopping for your dream prom dress, this does not have to be so. Especially with designs from places like Dressfirm. Here, the prices will not go up according to your size. They stay the same! Look at all the beautiful designs you have to choose from and almost all of them are well below $200. 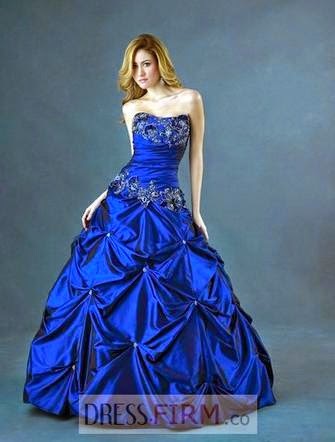 I absolutely love the Deep blue strapless and the violet halter style. They both have such beautiful ornate detailing in two of my favorite colors. Check out their whole collection of prom dresses for all sizes and pick your favorite. I am pretty sure you would be hard pressed not to find one that will make you feel like a princess on your special day!